The iPod nano has entered the video age. Apple unveiled a new version of its compact music player that features a built-in camera capable of shooting video. The new iPod debuted Wednesday during the company’s “Rock and Roll” event in San Francisco. Why a video camera for the nano? Apple CEO Steve Jobs says the company was inspired by the popularity of pocket flash memory-based video cameras like those from Flip and Kodak. 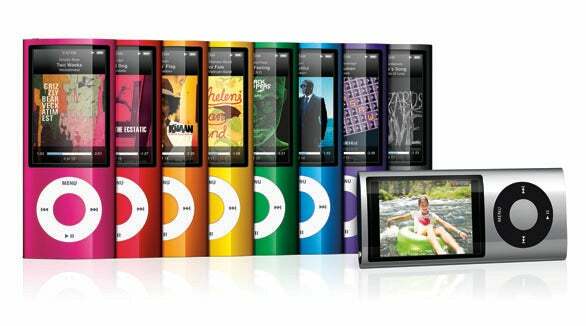 The new iPod nano comes in 8GB and 16GB models, each of which incorporates a video camera and microphone on the back of the unit, as well as a built-in speaker. The video camera shoots H.264 VGA video—640 by 480 pixels—at up to 30 frames per second with AAC audio in either portrait or landscape modes. In addition, the new nano features 15 special effects that can be applied in real time: Sepia, Black and White, X-Ray, Film Grain, Thermal, Security Cam, Cyborg, Bulge, Kaleido, Motion Blur, Mirror, Light Tunnel, Dent, Stretch, and Twirl. The nano can display video or sync it back to your computer, where you can easily upload the clip to YouTube, Facebook, MobileMe, or share it via e-mail. The microphone can also be used with the nano’s voice recording feature. With the addition of a camera, the nano joins the iPhone as the only Apple devices equipped with such a feature. (The iPhone has had a still camera since its 2007 debut; the introduction of the iPhone 3GS this June added video capabilities to the mix.) Noticeably missing from that fraternity? The iPod touch, which otherwise matches most of the features you’d find in an iPhone. Apple boosted the capacity of the touch and bolstered the performance in the 32GB and 64GB models, but otherwise left that iPod line unchanged. In addition to the built-in camera, the latest nano now has VoiceOver support, which provides audible navigation cues in 20 languages. It also supports the new Genius Mixes feature, which creates up to 12 endless playlists of music based on your existing library. A built-in pedometer can measure your steps and sync the information with the Nike+ service. And, in a first for an iPod, the nano offers a built-in FM radio tuner. The radio tuner includes support for live pause, which allows users to pause a live program and resume it later. (The radio features a 15-minute buffer.) Also supported is iTunes Tagging, which lets listeners tag radio songs they like and then preview and optionally purchase the song next time they sync with iTunes. Other than the camera, the physical form factor of the nano remains mostly unchanged, although it now features a larger 2.2-inch, 240-by-376-pixel, display and comes in nine colors: silver, black, purple, blue, green, orange, yellow, (Product) red and pink. The 8GB model runs for $149 and the 16GB for $179 (a discount from the previous nano, which cost $199). Both new models are shipping today. The new nano requires Mac OS X 10.4.11 or later as well as iTunes 9. iPhoto 6.0.6 or later is recommended for Tiger users and iPhoto ’09 for Leopard or Snow Leopard users. Windows users need Windows Vista or Windows XP Home or Professional with Service Pack 3 or later as well as iTunes 9. Updated throughout the day with new information about the iPod nano.